With all your favourite chocolates inside, this gift pack is designed to be loved by everyone. Celebrate your special occasions with your favourite chocolates. 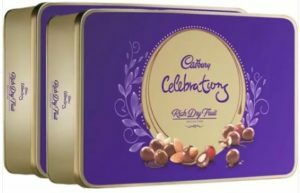 Flipkart is selling Cadbury Celebration Rich Dry Fruit Chocolate Gift Pack, 177 gm – Pack of 2 Bars (Pack of 2, 177 g) worth Rs.900 at Rs.450.